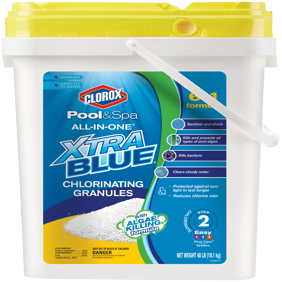 Keep your swimming pool clean with Clorox Pool and Spa Xtra Blue. It prevents the growth of green, mustard and black algae. It also kills bacteria and works without changing your pool's pH level. This pool algae killer uses a patented non-foaming formula, which keeps it from staining surfaces and makes it safe and suitable for most types of pools. Keep out of reach of children. See side panel for first aid and additional precautionary statements. Precautionary Statements: Hazards to Humans and Domestic Animals: Warning: Causes substantial, but temporary, eye injury. Harmful if swallowed. Harmful if inhaled. Do not get in eyes or on clothing. Avoid breathing vapors. Wear safety glasses or goggles. Wash thoroughly with soap and water after handling. Remove contaminated clothing and wash clothing before reuse. First Aid: If in Eyes: Hold eye open and rinse slowly and gently with water for 15-20 minutes. Remove contact lenses, if present, after the first 5 minutes, then continue rinsing eye. Call a poison control center or doctor for treatment advice. If Swallowed: Call poison control center or doctor immediately for treatment advice. Have person sip a glass of water if able to swallow. Do not induce vomiting unless told to do so by the poison control center or doctor. Do not give anything by mouth to an unconscious person. If Inhaled: Move person to fresh air. If person is not breathing, call 911 or an ambulance, then give artificial respiration, preferably mouth-to-mouth if possible. Call a poison control center or doctor for treatment advice. If On Skin or Clothing: Take off contaminated clothing. Rinse skin immediately with plenty of water for 15-20 minutes. Call a poison control center or doctor for treatment advice. Have the product container or label with you when calling a poison control center or doctor or going for treatment. In case of medical emergency, call 1-877-800-5553. Physical or Chemical Hazards: Do not mix with other chemicals. Environmental Hazards: This pesticide is toxic to fish and aquatic organisms. Note: User assumes all responsibility for use not in accordance with directions. Metals from source water, ionizers or poorly sequestered algaecides have the potential to stain pool surfaces. Treat these problems with an appropriate metal stain preventative (chelating agent( before using this product. Ingredients: Active Ingredient: Copper (Metallic) (Derived from Copper Sulfate Pentahydrate CAS No. 7758-998). (3.3%). Other Ingredients: (Contains Polymeric Polyacrylate and Gluconate Stabilizing Agents) (96.7%). Instructions: Directions for Use: it is a violation of federal law to use this product in a manner inconsistent with its labeling. Read entire label and use strictly in accordance with precautionary statements and directions. Adjust pH to 7.2-7.6 and free chlorine to 1-4ppm prior to use. Visit cloroxpool.com for free water analysis and personalized product and dosage recommendations. Use: kills or prevents green, mustard and black pool algae. Re-Entry: Wait at least 15 minutes after use before swimming. For Best Results: Add an extra 1.5 fl. oz. after heavy rain, frequent back-washing, or partial drain/refill. Brush surfaces weekly. To Close Pool: Add 16 fl. oz. per 12,000 gallons then operate pump and filter for at least 2-4 hrs. Visit cloroxpool.com for closing instructions. Storage and Disposal: Keep this product in its original tightly closed container when not in use. Store m a cool, dry, well ventilated area. Do not contaminate food or feed by storage or disposal. Product Disposal: Securely wrap original container in several layers of newspaper and discard in trash. Container Disposal: Non-refillable container. Do not reuse or refill this container. Offer for recycling, if available. Triple rinse container (or equivalent) promptly after emptying. Had a very green pool for 3 weeks. Tried various methods/products to kill the algae with no results. This product worked within 12 hours. I did not encounter any foaming as others mention. I highly recommend this. I bought the more expensive one thinking that would be better. My pool is still blooming 2 days later, and with all of toxic warnings on the back of this algeacide, I'm scared to pour more in until the 72 recommended hours have past. I was hoping this would do the trick, but honestly, NOTHING has changed with my pool. I upped the PH. I double shocked it. I backwashed and vacuumed. I used clarifyer....I'm not sure what to do next. Can't swim in it, that's for sure. I wish I had tried a different algeacide and not wasted my money on this one. I balanced the water and applied a bottle of this to my pool (26000 gal) and 24 hours later, absolutely nothing. Zip, nada, ziltch, $27 for NO results. I've had a pool for 30 years and I've never seen anything cost more and do less. I can't believe it did nothing, but the algea is still the same. I did everthing according to the instructions. I would rate this product in negative numbers if available! My pool had a green tint to the water so I purchased the Xtra Blue Algaecide because my product that I normally use was out of stock. The green tint almost immediately became dark green and soupy thick, which the recommended 24 hours running the pump did nothing to help it! I treated 2 more times, ran the pump and waited the 24 hours each time, and it only gets worse. This product costs too much and now will cost even more to get my water back to swimming condition. UGH, have NEVER had anything like this happen before! I spent almost $30 on this because my local pool store was closed (owners went on vacation) and I wanted to kill the algae in my pool quickly. I added the recommended dosage and nothing.....Added the rest of the entire bottle and still....nothing. I had all of the chemicals in the pool right where they needed to be according to the test strips and still had a gorgeous green pool. I would not recommend wasting your money with this. Bought an algaecide from the pool store after the owners came back for $22 and one dose later, my pool is cloudy and ready for floculant, AND I still have enough left in that bottle for, probably the next couple of years. Tried for the first time and it did nothing. Pool never got Blue. I have always had good success with the Green Algae Eliminator which is 1/2 the price. Wasted $30 and then had to go buy the $15 Eliminator that actually works. Bought this product even after reading the horrible reviews, thinking maybe it was user error, hoping it would kill/clear the little bit of black algae I had in my pool. NOPE! I balanced my salt pool perfectly, even had it tested to make sure. I did exactly as the directions on the bottle instructed, including heavily brushing with a wire pool brush to break up the protective layer on the surface of the algae. It was like a thick cloud of blue in my pool, you could barely see the bottom of the shallow end & not at all in the deep end. I brushed every day, 2-3 times each day, for a week while keeping everything balanced. It kept my pool that cloudy blue, it started causing a little foam when the water was disturbed after the 3rd day, didn't do anything to the black algae, & only kept scale from forming on the walls. I eventually got all that blue cloud out & chemically cleaned my filter & equipment. A week later the black algae was 100x worse! It originally was only in the shallow end, a few small patches on the one wall that gets the most sunlight & some small spots on the floor near that wall. It turned into the whole pool, even the deep end, all of the walls, steps, benches, floor, & even our dolphin tile on the center bottom. I went & got a different product from my local ACE, & less than 2 hours later it is almost all gone. DO NOT WASTE YOUR MONEY ON THIS! If I could give less than 1 star, I would.